I love fruit-based salsas. They’re wonderfully versatile, using whatever fruits are in season and look good. And, they’re good on just about anything. On fish, on chicken, on pork, wrapped into a burrito, with tortilla chips…are you picking up what I’m putting down here? This mango avocado variety is my hands down favorite topping for fish tacos. 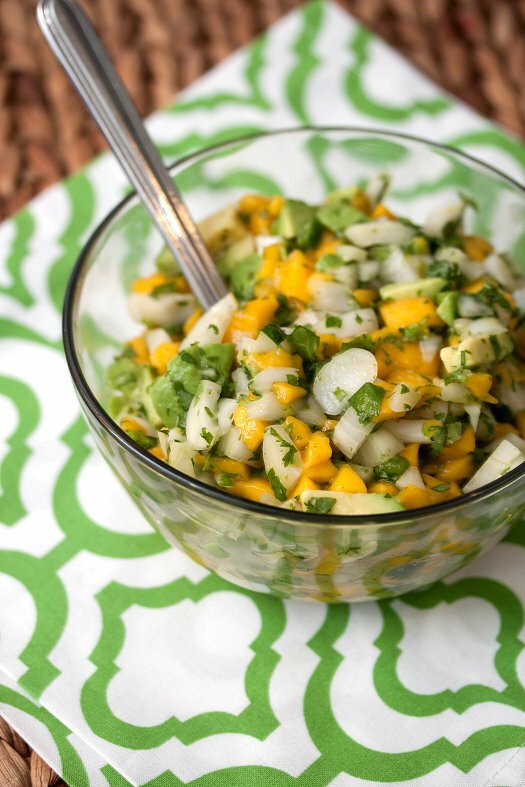 The sweetness from the mango, a crunch from the onion, a little bit of heat from a jalapeno, and a big dose of freshness from lots of chopped cilantro. I usually go with red onion for my salsas, but I had some gorgeous Cippolini onions from my crop share this week. They were mild and sweet, but they worked well with the salsa. There was a slight chill in the air this morning. We still have August to look forward to, and I plan on enjoying every minute of the abundance of ripe summer fruits while they last. I hope you do too! Wow! This salsa looks delicious. I definitely want to try it. Thanks for sharing this recipe. I bet this would be awesome on salmon or crab cakes! Love mango salsa! I kind of want a bowl of this right now! Avocado and mango just seem to be made to go together, don’t they? During this visit to Vermont I have been buying champagne mangos for my mom. At age 92, she is loving them! Your photo is beautiful! Hope you can get California avocados where you live!